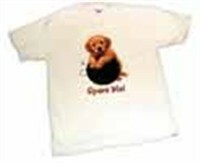 100% Cotton T-Shirt with 'Spare Me' puppy screenprinted on front. Available in either children's or adult sizes. Due to the time it takes to produce the Spare Me Ball & Puppy T-Shirt ball it will ship in immediately. We cannot ship this ball outside the United States.